Have a look at our fabulous display of 100 reasons why our children love our school. All the ideas were collated from our house team assembly and the children from F2 all the way to year 6 copied the ideas onto individual hearts. Please have a read if you are ever in school, you can find our display in the KS1 hall. Well we all enjoyed a really productive Enterprise Week and it was lovely to see how much the children really value the school and the things that we have in place to support their learning and development. As a result of all the work the children have done, the following changes are going to take place. Nursery (F1) – The nursery children decided that they would like to change the stage in their outdoor area. They are going to speak with Mr Brady and Mrs Kelly to see how much it would cost and if a new surface can be provided. This would have a positive impact for all nursery children as they would be able to safely access this area in all weathers and it will develop a more creative area for the children. Reception (F2) – The reception children have been looking at healthy eating and designing their own healthy school dinners. They are going to speak with our school cook so that some or all of their meal can be included on our school dinner menu. This will mean that all reception and year 1 children will have this meal as their choice once every 3 weeks. It will also be an option for the year 2 children and the KS2 children. Year 1 – The year one children have redesigned the friendship bench on the KS1 playground. Mr Brady is going to sand it and then Mrs Watts and her nurture groups are going to paint it in rainbow colours. This will make the bench more appealing to all as currently the children think the bench is “too girlie”. All children will then have a safe space to go to if they are looking for someone to play with. Year 2 – The year 2 children worked on ways to improve the lunch hour when they are outside. They talked about different games and activities they could do. Year 2 are currently speaking to Mrs Orange to look at any equipment that is broken and needs replacing and then any new equipment they could buy. They will also be speaking to Mrs Kelly about the cost. This will enable all children on the KS1 playground to have more activities at dinner time which will improve social engagement and positive behaviour. Year 3 – The year 3 children were tasked with making people feel good. As a result of this every member of year 3 has been given their own individual jobs as they want to be more helpful. This is helping to build responsibility and resilience within the year group. Some examples include; Megan who is responsible for the dinner bands and attendance marking, Mheiia and Laila who are the information messengers and Pria and Jake who are in charge of giving out the books. Year 4 – Year 4 were tasked with designing the perfect midday supervisor. They wrote jobs descriptions and designed their own robot midday supervisors which are now on display in the corridors. The next time a midday supervisor needs to be appointed, two children from year 4 will use the job descriptions they created and will help to interview the candidates with Mrs Molyneux and a member of the SLT. Year 5 – The year 5 children have been thinking about after school clubs that they would like to access. They have met with Mr Bowles and he will now be doing a dance club on a Thursday evening after school just for the year 5 children. Year 6 - The year 6 children were given the tricky task of making the school more aesthetically pleasing! After a lot of discussion they decided that they would like to move the large bins and recycling bins which are in our school car park. Mrs Kelly is currently looking into this as there are certain regulations which need to be adhered to. The year 6 children will also be involved in deciding where the tiles will go to decorate our school once they have been varnished and sealed. We had a fantastic time enjoying Enterprise Week 2018. We started with house team activities where we celebrated all of the things that we already love about our school (there were a lot!) and then we created tile designs to show the things we love the most. Throughout the week, every child has created their own ceramic tile using special pens. We hope to display these on the outside of our school building. EYFS1 - To design an attendance hero and a chart/display for the heroes to climb/finish. EYFS2 - Create a new healthy dinner to add to our school menu. Year 1 - To create a new friendship zone for the KS1 playground. Year 2 - To create a plan for some lunchtime games/clubs. Year 3 - To think of a feel good companion/pet suitable for year groups 1 - 6. Year 4 - To design a perfect midday supervisor. Year 5 - How can we improve after school clubs? Year 6 - How can we make school more aesthetically pleasing from the front (including the school office)? Every year group really embraced their activities and we enjoyed seeing what everyone has been doing during Friday's celebration assembly. 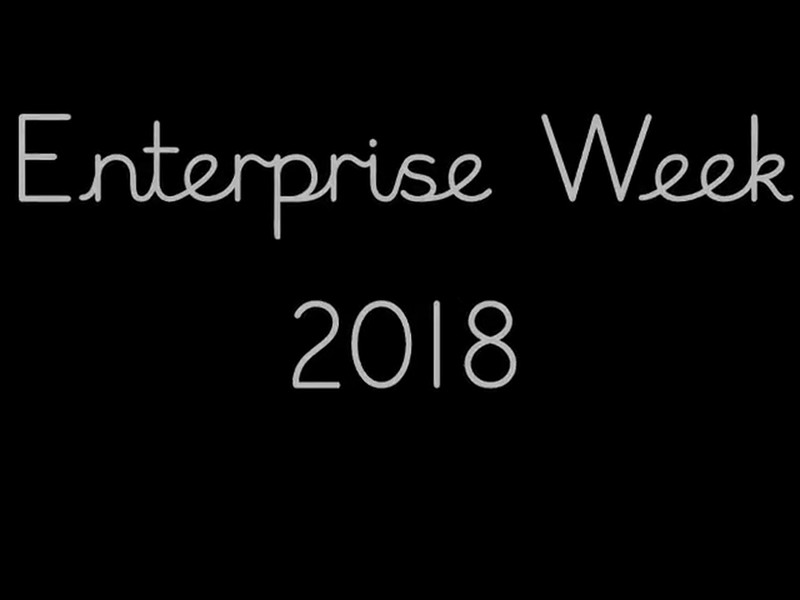 Here's a little snapshot of our Enterprise Theme Week. Have a look at all the fabulous things that we love about our school!